Standing: Dr. Joseph B. Turner, Charles H. Souther, and Rev. Keith Jones. The 2008 annual Dyer-Souther Heritage Association Reunion, held July 19, 2008 at the Choestoe Baptist Church in Blairsville, Georgia, featured a display of books written by family members. 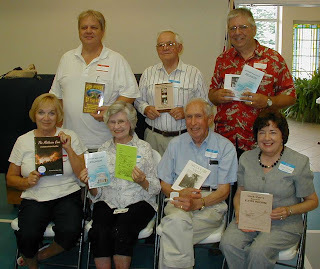 Pictured above are family authors who were present at the reunion. Then, in late 2004, a great-great-great-grandson, Joey Dyer, was searching the internet when he managed to locate Clark’s patent in the U.S. Patent & Copyright Office. What a discovery! The family was elated to finally see the patent, No. 154,654, which was issued to Clark on September 1, 1874, by the United States Patent & Trademark Office. 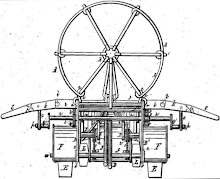 The sophisticated drawings and detailed specifications of the flying machine that Clark had included in his patent application were most remarkable. The aeronautical principles he had addressed were way ahead of anything that others trying to invent a flying machine had yet envisioned. 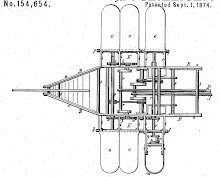 He included many innovative features: a power source, a rudder for steering, paddle wheels for acceleration and deceleration, jointed moving wings to increase or decrease altitude, and a wedge-shaped hull with inclined prow to reduce wind resistance. Mr. Dyer has been studying the subject of air navigation for thirty years…he himself has the most unshaken faith in [the machine’s] success, and is ready, as soon as the machine can be constructed, to board the ship and commit himself to the wind. Very belatedly, recognition was given to Clark’s invention by erection of three highway signs in 2006 declaring State Highway 180 from the junction of U.S. Highway 19/129 to Brasstown Bald Mountain Spur the “Micajah Clark Dyer Parkway.” Now everyone who drives along this popular road gets the opportunity to recognize a pioneer aviator who had to wait 132 years for “his day” to come. The 2008 annual Dyer-Souther Heritage Association Reunion will be held Saturday, July 19, 2008 at the Choestoe Baptist Church, Family Life Center, 4455 Choestoe Church Rd., Blairsville, Georgia. Registration begins at 11:00 a.m. The Reunion honors the memory of early settlers to the Choestoe District of Union County--John Souther and Mary "Polly" Combs Souther and Elisha Dyer, Jr. and Elizabeth Clark Dyer--their descendents and related families. The Reunion draws about 200 people each year and is a highlight in sharing genealogical information and getting acquainted. A Memorial Service honors relatives who have passed away since the last Reunion. You are invited to attend and participate. Bring a covered dish to share at the noon meal.